I am Tina Farinola Savino and I am a seven-year breast cancer survivor, mother and a flight attendant. I was diagnosed with breast cancer in the spring of 2007, a newly divorced 44-year-old mom of two young boys, Massimo, age 4, and Luca, nearing age 3. It was a beautiful spring day when I received that phone call from my ob-gyn’s office on a Friday afternoon as we were all outside playing. My first thought after I was told that I had ductal carcinoma in situ (DCIS, early stages of breast cancer), was sheer panic. As I watched my children play, the tears and fears hit me. All I could think of was, “What about my young children?” They were too young to be left behind. So, like most people, I called my family and hit the computer. Thankfully, I had the sense to move away from my thoughts and took the weekend to absorb and embrace the diagnosis. I did, however, have to fly the next day and worked in a state of complete numbness. I discovered a lump as I was showering a week and half before getting ready for work. My doctor performed a physical exam and was guessing at the time that it was just a swollen lymph node since it was so close to my armpit. I had also been experiencing a tremendous amount of abdominal pains for about seven months prior to the diagnosis. Most doctors wanted to diagnose the abdominal pain as irritable bowel syndrome and stress due to my proceeding divorce, but I secretly knew it was more. My doctor ordered an ultrasound on my gall bladder, kidneys and liver but everything looked clean. Nevertheless, she set up and exam for a mammogram and ultrasound since I had only had one previous mammogram in between my two pregnancies and it showed clean. At that point I was not too concerned because I had no history of breast cancer on either side of my family, which included eight aunts and two grandmothers. When I went in for my mammogram and ultrasound at St Luke’s Hospital in Houston, even the radiologist gave me a low percentage for the lump being cancerous. Its shape was not similar to typical cancer shapes. The lump was a little less than 1 cm across. “Maybe a 20% chance that it could be cancer,” is what I was told. I was also told that I have very dense breasts and that a biopsy would determine the diagnosis. After multiple family discussions, I decided to get a second opinion, which confirmed the first diagnosis: nothing showed in the mammogram and only a small lump on the ultrasound. I then chose a doctor and hospital to proceed with my treatment. I chose MD Anderson in Houston. In the meantime, my ob-gyn was constantly monitoring some solid masses surrounding my ovaries. After my diagnosis of DCIS, we decided to proceed with a laparoscopy to determine what was going on with my ovaries and possibly perform a single or double oophorectomy (removal of the ovary). During the surgery my doctor decided that everything looked good, but that we would continue to monitor my ovaries with ultrasounds. My breast surgeon suggested a lumpectomy followed by radiation, which sounded good to me. So, 10 days after my laparoscopy, I had the lumpectomy. The pathologist’s results showed the tumor to be much larger than both ultrasounds: about 4.5 x 2.5 cm, not exactly small but non-invasive. My surgeon told me she couldn’t get a clean margin on two sides of the tumor, but felt confident that the radiation would take care of the area in question. I began to feel uneasy about this but went home to recover as quickly as I could so that I could resume taking care of my boys. Two weeks later I returned for my post-op visit and for my first visit with my breast radiation oncologist. My mother and sister, Claudia, came with me so that I could get all the correct information with my “secretaries.” While meeting with the radiation oncologist, she shared with me the pathology report, which showed my tumor to be the highest grade of cancer with a 12-20% chance of it returning. The problem was that after radiation, it is difficult to reconstruct a breast if the cancer returned. I was not comfortable with those numbers since I already had a low batting average, so to speak. I was told to think about a mastectomy, which I was already considering. I then went to my next appointment with my breast surgeon oncologist. She was very pleased with the results of my surgery but I informed her that I was now thinking of a mastectomy for added insurance; I wanted to be around to raise my children. After speaking with my radiation oncologist and my family later that night, I made my decision to go through with the mastectomy. Also, at this point, I declined to take the standardized protocol of Tamoxifen, because my levels of estrogen were not high enough to outweigh the risks of taking the drug. Six weeks later, I had my mastectomy. It was not without some minor complications because of the skin sparring lumpectomy, but I made it through a couple of rough days in the hospital. I went home to recover and within two and half weeks after the drainage tubes were removed, began my true healing. I was, however, left with severe atrophy in my right arm and had to begin a four-month, three day-a-week intense physical therapy to regain the use of my arm. I could not lift passenger’s bags, nor even close the overhead bins. It was even difficult for me to drive. 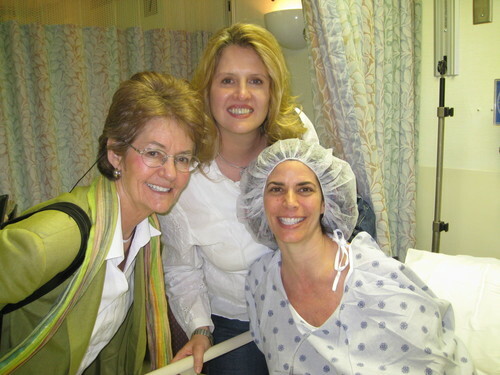 At this point I also began the long process of breast reconstruction with the tissue expander and implant process. I then had the second of my four reconstructive surgeries. Seven months after my diagnosis, my younger sister, Claudia, was diagnosed with stage one breast cancer. This was a tremendous blow to our parents. Claudia’s pathology results showed her to be ER/PR (estrogen/progesterone) positive as well as HER2 positive. Her journey would include a single mastectomy as well, plus chemotherapy. It was a very tough battle for her. Because I work for the best airline ever and have wonderful insurance, I was able to get BRCA testing done, but not without a fight from the young gene specialist at the hospital. Thankfully for Claudia and me, the tests were negative. In the meantime my stomach issues continued and after further testing, my gastroenterologist feared that I might have some tumors in my intestines. My ob-gyn wanted to check out more tests results of solid mass again on my ovaries. I was now starting off 2008 with my five surgeries with in one year. I had already taken a six-month leave from work in 2007 and was facing more time off in 2008. My family support truly helped me with the care of my young boys but I was honestly beginning to feel the emotional and financial drains of all these surgeries and time off. So, as I headed off to this big surgery, I continued my ritual of praying my grandmother’s rosary and hoping for the best. My ob-gyn began the surgery. She found my right ovary engulfed by a benign tumor and performed a single oophorectomy. She discovered something in her scope leading back to her original suspicion of my gall bladder the year and a half before. Next, the surgeons inspected nine feet of my intestines and found nothing other than a very diseased gall bladder that was blocking my intestines. It was removed, too. I remained in the hospital for six days to recover and I lost nearly 10 pounds, quite a bit at the time. This delayed another part of the reconstructive phase on my breast; I was supposed to have fat grafting performed to help with the shape of my new prosthetic breast. It took me nearly two months to gain back the weight in order to perform fat grafting surgery. Also, I couldn’t lift anything over 10 pounds for four to six months afterwards, due to my internal sutures. It was a very challenging time for my boys and me. Thankfully, they learned to climb up on the dinner table and into their high chairs and mastered the art of getting into their own car seats. But I surely did miss picking up my babies!!! Within the next few months, I was able to have my next two reconstructive surgeries to complete my “new look.” Even though I had non-invasive cancer, I suffered through seven surgeries within one year, four months of physical therapy and an additional month of lymphedema therapy because of the removal of 14 lymph nodes in my right arm, and a year off from work. I continue to battle lymphedema issues today. The most important fact of this story is that I’m here and I survived breast cancer and I will be around to raise my children. I attribute this to my faith in God, my family support and my will to stay strong. I got in the gym in between every single surgery, even with drains!! I implore everyone to be pro-active in your health and routinely perform self-exams. Listen to your body. My sister and I were very fortunate to have family support and we are very blessed in many ways.